So you’re working with the carrier by the name of U.S. Cellular here in the United States, are you? You’ve been waiting for what seems like forever for a device that’s any better than the HTC Merge? Today (or tonight, rather) is your lucky day (and night) because your smartphone companion for your Motorola XOOM is here, and it comes in a dual-core flavoring! 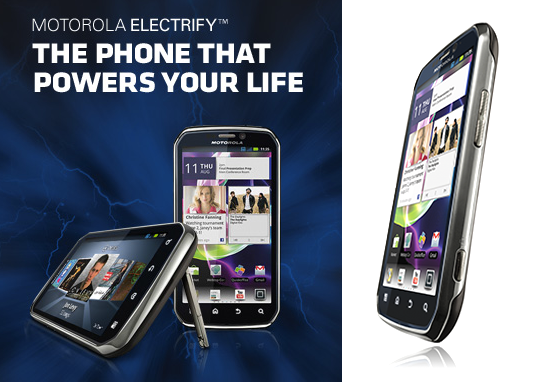 It’s time for the Motorola Electrify, a device that’s basically the newest version of the Motorola Photon 4G and the Motorola ATRIX 4G, aka the first dual-core smartphone to be released in the USA officially. Now we’ve got the ELECTRIFY coming to U.S. Cellular and it’s coming tonight! That’s right, ladies and gentlemen, you can pick up this Android 2.3.x Gingerbread toting 4.3-inch qHD Touch Display having dual-core 1GHz NVIDIA Tegra 2 AP20H processor that you’ll be able to use to access the NVIDIA Tegra Zone where you’ll be able to grab a whole handful of HD games that work ONLY on Tegra 2-toting devices. You’ve got an 8-megapixel rear-facing camera, a VGA camera on the front, and 16GB of storage built in. There’s also a microSD card slot so you can add up to 32GB more storage. You’ll also get Motorola’s Webtop software and the ability to purchase all kinds of accessories. All of this is covered essentially in the Motorola Photon 4G review we’ve got, just imagine that it’s got U.S. Cellular markings on it instead. There’s certain to be more than a few application change-ups as well, so of COURSE we’re going to do a full review of this device for you barring some sort of major natural accident. All this said, midnight is the time. Over on U.S. Cellular’s website at http://www.uscellular.com/ you’ll be able to purchase the Motorola ELECTRIFY for $199.99 after a $100 mail-in rebate tied to the purchase of a data plan. Data plans for new customers are two-year agreements and activation fees may apply for new customers as well. Those who are already on U.S. Cellular and have Belief Plans who are eligible for an upgrade will be able to get the promotional price without signing any sort of new contract. Fun!